From the moment I met her, I knew we would be good friends (let’s call her Megan). She was fun to be around, had similar values and beliefs, and we simply meshed. After we started getting to know each other, I also realized I could trust her. We spent the next several years growing closer and finding more and more time to spend together. I loved her deeply. She was a friend that I needed at this time in my life and I thank God He brought her my way. At the end of my marriage and then when I separated and eventually divorced, it was a very low time in my life. I was emotionally a wreck and if you were close to me at all during that time, you knew it. My heart was far from God and my actions were indicators of the pain I suffered. I was trying to crawl back to my Creator but my toxic behavior kept getting in the way. Megan was there and knew all of my story. She saw my raw emotions and the contents of my heart. Let me tell you, it was an ugly sight. Sometime after the separation, she started distancing herself from me. I would try to call and text but she wouldn’t respond at all or would respond with short answers. I tried to hang out with her, but she would say she was busy. I asked her if anything was wrong several times but never received a straight answer. Then one day I received a letter from her in the mail. In short, she said she couldn’t stand by and watch me self-destruct and she could no longer be my friend. What followed were days of crying and years of grief over my lost friendship. I bared my soul to her and it was too ugly for her to continue being friends with me. I was devastated and my entire identity was shaken. It took me years to come to terms with this loss. If there was one thing that made me feel worthless and alone, other than my divorce, it was this. I hated myself for it. And I was angry at her. She left me when I needed her most. As I reflect on it today, though it stills aches a little, I’ve forgiven her and have shifted my thought process to give her the benefit of the doubt. By the time it happened, I honestly had so little communication with her, that I did not know what was going on in her life. She very well could have been in a place in her life where she needed to separate herself from toxic people. Her relationship with God was very important to her and I believe she was honestly doing what she felt God had called her to do. Whether she was right or wrong is irrelevant. Releasing and forgiving her had more to do with me and my healing than anything else. Since then, God has worked in and through my life in so many ways. I allowed Him to perform heart surgery on me and am a completely transformed woman. Fast forward several years: Similar scenario. I recently met a woman with whom I immediately connected. Let’s call her Carrie. We met at a time in which God was similarly working in our lives to heal past hurts and pain and immediately found a heart and soul connection with each other. We have grown close very quickly. Last week, she went on a women’s retreat. The day before she came back, I had a thought that I immediately snuffed out. “What if she comes back, realizing that she doesn’t need to be friends with me anymore.” I didn’t let it linger but it was there, rearing its ugly head. When she called me Monday and wanted to see me for a few minutes, it didn’t even cross my mind. But when she told me that she was so thankful for me, that she wanted me to know how very special our friendship was to her, and that she loved me more than I would ever know, I lost it. Completely lost it. As I sobbed uncontrollably and as she probably wondered what in the world was going on with me, I simply hugged her, told her thanks, and that I felt the same about her. You see, sometime during our conversation, I remembered that terrible thought I had. And I felt like my Daddy was reaching down and giving me a big ol’ hug through my precious friend. He was telling me that those days are over, that I am a new and beautiful creation, and that He’s proud of me for the progress I’ve made. He used Carrie to love on me and I will forever be grateful. I treasure the friendships I’ve had in my life. Some have stayed with me through thick and thin. Others have drifted away. 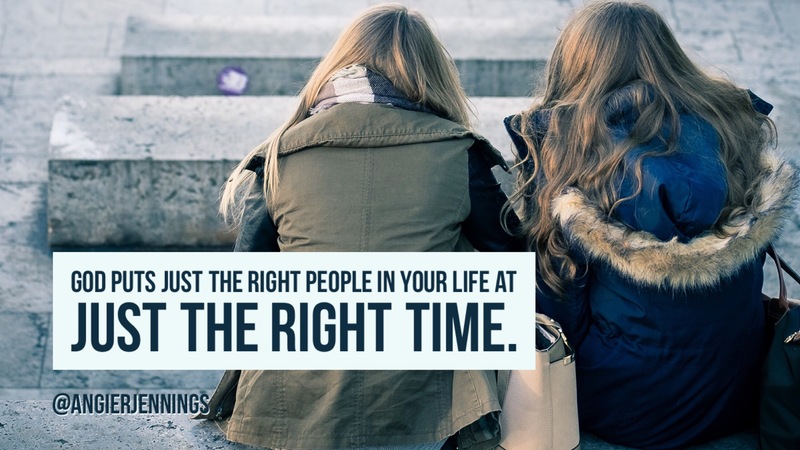 But I’m a firm believer in the fact that God puts just the right people in my life at just the right time. So to Megan, I miss you. God put you in my life for a reason. You helped me through so much and nothing that happened could take away my gratitude for you. I am a different person now than I was then and God has completely transformed my life. I’m certain you would be happy for me. I wish you the very best and will love you always. Tags: broken friendships, Friendship, Grace. Bookmark the permalink.